It was a long wait, what with the US government shutdown and a new year requiring spreadsheet updates, but here is the first PIOMAS update of 2019. Good news! So far, the winter has been good for Arctic sea ice. The past three months have been relatively cool, especially when compared to the previous three winters, which broke all temperature records for the Arctic (see Zack Labe's excellent graph here). Of course, PIOMAS has responded in kind. With 3456 km3, January was well above the 3179 km3 average for the 2007-2018 period. 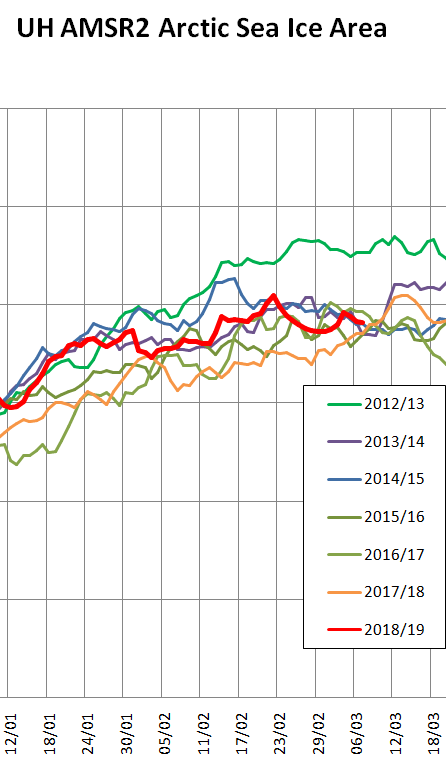 And so, 2019 starts out as 7th lowest on record, a whopping 2500 km3 behind ranking leader 2017, almost doubling the gap since the end of November. It's one of those interesting scientific mysteries like we saw a few year's back, when CryoSat misinterpreted thick snow cover for sea ice (which told us there had been more snow than usual that winter). We'll have to wait and see how this plays out in the next 2-3 months, and whether it tells us something we wouldn't otherwise know. As we've seen in the past few years, wintertime conditions have less of an impact on the September minimum than do summertime conditions, but nevertheless, it's good to finally have a winter again that's somewhat good for Arctic sea ice. Still two months left to go for the ice to thicken some more. Thanks for the update! I've been checking this site daily for a while to see when the update would come. Glad to see this year continues to be good for ice making. The Cryosat thicker sea ice gains North of Greenland and Ellesmere Island seem realistic, equally so the loss of accretion over Beaufort sea area. Which I have been observing indirectly since the start of winter. Word of caution if cryosat animation is correct, as it seems so, there was a lot of open water in the area appearing to have gains. There was , for those who read this site, a lot of open water where never there was, this open water made out to be very thin sea ice eventually surrounded by multiyear packs. One would think , the adjoining surrounding multiyear may accelerate the accretion of the thinner, but that is unlikely, the thinner has more warm sea water under it because of the multiyear thicker insulation, expect the North of Ellesmere and Greenland waters to return, despite favorable weather conditions for freezing. 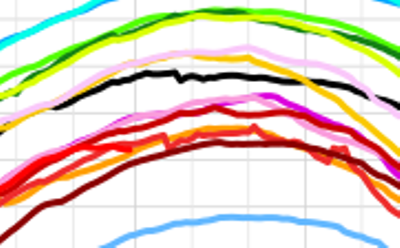 This means that PIOMAS is overall correct in estimating thinner over all sea ice in the same area. Both PIOMAS and Cryosat are in agreement there. Is much better to state: The reason why there is more frequent extreme weather events is because the coldest atmosphere areas are shrinking...... Than to say it is because of the jet stream moving things around. Certainly, it's a recovery year unlike any other: this creates interest like no other, however, because no single statistic can be 'the one'. Have I been overly hasty? Jim, I think your idea can be corroborated by the fact in the last few days the ASIC Graphs page have been flashing red for all 3 anomalies: those being the 1-day, 7-day, and 30-day averages! I was calling jackpot that day(why!?? !, Um,.. lol) but you cashed the chips by backing yours up with words and numbers and stuff: I congratulate you sir if this bears out as fact! Plus, given the forecasted temps, your theories have more than a decent chance of staying true. ...lol: just checked dmi temps... so these dmi temps seem to follow observation of other conditions somewhat, I'm guessing, yes???? - If Feb. 22 held as max. ASI extent, how would that rank vs. other years? From your 2012-13 thru 2018-19 graph of AMSR2 Extent, it looks like Feb 22 2019 would be 1st or 2nd earliest date vs. those years, but not necessarily the larger set of years. - Counterintuitive (for me at least)that recent years have hit the maximum later than the 1981-2010 avg. date even though at lower Extent. Seems like with more warming and less growth of Extent, the maximum would be reached at an earlier date while also reaching lower value. - The 1981-2010 max does have a broader "top", with decline after maximum in recent years starting earlier, as I would expect. But I don't see why would the maximum would occur later in a declining trend. - Something tells me this is forehead slap simple (as in Homer Simpson "Doh'"), but I don't get it. Neven has graciously allowed my "2019 melting season" thread to run its natural course on the Arctic Sea Ice Forum. It's not "sticky" just yet though! @AJbT - Would you bet your shirt on it? Alaska region and Bering Strait was unusually warmish most of winter 18-19. It should be the signature area of the coming melt season. I'd say the maximum occurred in February if we impose say a 50 cm minimum sea ice thickness as a rule. I'm sure your right with your final point. There was a "flash melt" in the Bering/Chukchi region, followed more recently by a "flash freeze", as well as more freezing in the most "peripheral" seas. There is great momentum afoot in the A.O. gyre area , along with no sign of major circulation change (which has not changed in months), top that with El-Nino about to break? These combinations are lethal for sea extent during the melt season. The whole outlook is not good as usual, how bad it will be is a matter of about 1 month analysis, the current end of winter beginning of spring season. El-Nino breaking to La-Nina, but it has been topsy turvy remote sensing very difficult to judge whether it will be so, very few horizon high cloud streaks tend to suggest a turn to La-Nina, this is one reason why we need 'bout a month to detect a trend, current sun disk measurements suggest a cool Arctic Archipelago sky, first sea ice under-melt is not apparent yet. I'm forced to quibble with "it's a definite recovery year"! Case in point, open water mixed with much older sea ice at previous minima date just did not got compressed but rather froze , remained much thinner than new sea ice plains, because surrounding older sea ice keeps under laying sea water warmer, a main component of accretion. Any prospects of an update on February. Yes, sorry about that. I'm so busy right now getting prepared for a new gardening season, and building a big duck house, that I'm too tired in the evening to do the PIOMAS update. As it's too late now anyway, I promise I'll do the next one on time. I think the Global Sea Ice figures will prove to be one of the main indicators we look back at as a species to say that we saw it coming and it was all on the internet. Obviously I believe the multi-year sea ice figures in the Arctic are of a prime importance but if anything where to challenge that significance it would be the eerie signal given by the global sea ice graphs. 3 cheers to Gerontocrat for his endlessly updated hardwork on the forum. The Artic could be heating up over the next week big-time apparently! Thanks for keeping the thread alive Jim. Climate Reanalyzer temperature forecast indicates Arctic sea ice could take a beating in the next 10 days. Wipneus Sept. minimum ASI volume linear projection shows 2019 at just a whisker above 4M km3, only 3M km3 above the arbitrary 1M km3 threshold for "mostly ice free" Arctic Ocean. The Wipneus residuals plot shows 1982 with almost a -4M anomaly. Thus, while extremely unlikely (and well below 95% confidence interval) it would not be unprecedented for ASI to fall 3M below estimate and reach 1M km3 this year. In any case, linear trend crosses 1M km3 only ten years from now in 2029. The continued decline in old thick ice shown in the Great White Con link Jim posted above suggests that the remaining ice is increasingly vulnerable to summer melt. Hoo boy--Climate Reanalyzer has the Arctic at a blazing 7.1 C anomaly this morning! If this keeps up for a bit--and the outlook maps say it will--that's going to be an early boost to the melt season. No surprise at all, it was lingering about # 1 all the time (precluding thin new sea ice) , thinner sea ice doesn't take much to disappear. There is evidence of a strong favorable for further melting circulation to continue well onto July... Will have more about this soon. First sea ice horizon melt happened about the 20th and the Cold Temperature North Pole has been shrunk well different than preceding few seasons. That's based on JAXA data. I see 2nd place from 2017 by a mere 13K , on JAXA, and 3k more than 2006, essentially #1 lowest shared. Must be shocking to those calling for a recovery, the proper analysis may take more effort, I would really like see 3 meter ice extent data over years. I am sure this is more telling, the nature of analyzing sea ice is a bit more complex than ice or none. The proper overview is like at least 8d chess: winds, sst, mean surface temperatures, snow cover, momentum, currents, thickness intermix, albedo ...... But all sums up as thickness, this simplest interpretation is essential to measure. So... 2019 is running close to the all-time minimums for end of March Arctic Sea Ice extent and area. Volume as of mid-March was near the lowest in terms or year ranks, but about 10% higher than mid-March 2017. Add to that -- DMI 80+N temperatures for the 1st 90 days of 2019 show that the positive anomaly is less this year than for most of the other recent years. Thus, low ice level despite not much push from Jan-Mar Arctic air temps. Then add Climate Reanalyzer shows high Arctic Ocean temps. for at least the next week. If the Arctic air temperature outlook is on the warm side for April-July 2019 as Wayne noted, that adds more credence to the high melt potential. All of which has me suspecting this melt season could be setting up to reach low end Sept. extent/area/volume records. But air temp history and forecast is only part of the picture. Is there a regularly updated chart of average observed Arctic Ocean sea surface temperature that parallels DMI air temps? (Or is ocean temperature measurement not feasible or meaningful when there is a lot of ice cover?). Likewise, is there an Arctic Ocean water temperature outlook? The third major variable seems to be cloud cover and low pressure systems early in season to set up "melt pond momentum". Is there an accessible source that provide Arctic cloud cover forecast in context with likely impact on sea ice melt? What is the relative strength of influence for air temp. vs. ocean temperature vs. cloud cover on resulting September area extent and volume minima? Are their relative influences different for extent vs. volume as end point measures? (Same questions apply to area, just trying to keep it simple). Finally, extent is an easier to acquire but less informative measure than volume. As the absolute amount of ice shrinks, it seems that Extent would become an increasingly skewed indicator for volume. Is that correct? 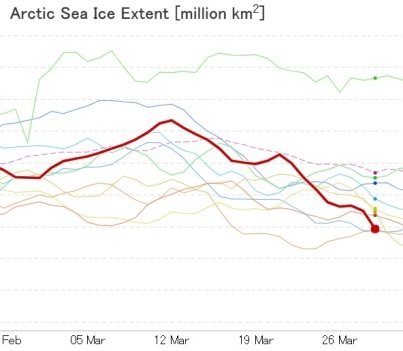 I would say that extent becomes an increasingly skewed indicator as the absolute amount of sea-ice shrinks, yes! 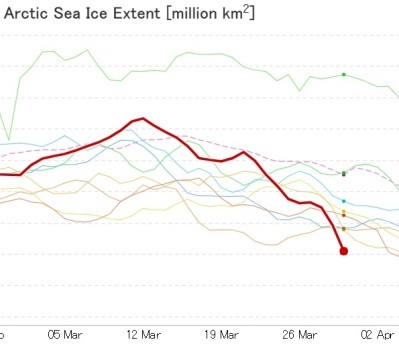 Saying all that of course, I feel the urgent need to report that NSIDC shows that Artic Sea Ice Extent has just fallen below two standard deviations. Perhaps we should all be worried AJbT? that was because circulation was changed by the sea ice. 2019 has a different circulation structure which favors a greatest melt again. March 31: Climate Reanalyzer showing temp anomaly of +7.5C. The ice arches will be no more, soon, and the strait is open. The SE Beaufort is pretty smashed up. The Arctic Oscillation Index is currently very positive, meaning warm air is being sucked in via the north Atlantic; however, models say this index will reverse soon. A positive AOI in the months of March through May means strong melting - the effect lessens in June. I thought Nares Strait had been open for weeks!??! AJbT - With little interruption the Nares Strait has been "open" to sea ice traffic for many months. So, Jim, how unchartered (sorry, no pun intended) is this behaviour of Nares Strait? Jim, did you also notice https://tinyurl.com/yyk5raa8 the piomas anaomaly graph has dropped quite markedly?!!? "According to the PIOMAS model Arctic sea ice volume has been flatlining for the last couple of weeks, and may even have peaked already!"